Investing In US Equities..But What About The Devaluation of the US Dollar? One of the questions I hear about investing in the US Market (as an international investor) is the recent devaluation of the US dollar. While I agree that its a valid concern, I would like to highlight something to my readers to put this in perspective. It’s interesting to note that anyone buying USD now with SGD will be buying it at a 10 year low. Bear in mind that this doesn’t mean that it has bottomed out. If the FED continues to pursue further quantitative easing with QE3, we might see the USD devalue further. However, these figures cannot be taken alone without looking at their historical context. Bear in mind that with interest rates at virtually 0%, the Fed was forced to resort to quantitative easing to provide and additional kicker to the economy. What I believe is that at some point or another, the USD will inevitably strength against the SGD. Quantitative easing will come to end at some point or another, and the FED will be eventually be forced to move interest rates back up again, forcing the current trend to revert back to to the mean. Of course, when this happens will be open to debate, which brings me to my next point. 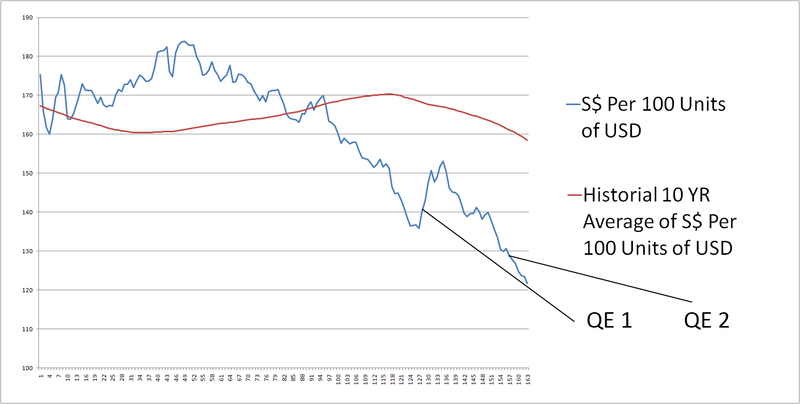 If you’re a long term investor (3 – 5 year time horizon), than I believe that investing in US equities is far more attractive than investing in Singapore equities – simply because of the 1) More attractive valuations 2) Historically Low USD. If the USD continues to weaken, it provides (in my view) an advantage for the long term investor as it will allow him to add onto his or her positions at a cheaper rate. I do not believe that this current trend will last forever, and sooner or later, the US economy will rebound and get its balance sheet back in order. Of course, if you’re investing with money that you might need soon, or have a much shorter time horizon, than dabbling in US equities might not be the bets option available to you as you expose yourself to the short term trends in the forex market. Long term national strategic economic policies and measures determine long term currency trends. US is doing very little long term measures and its institutions don’t seem capable of them. My feel is that US will go the way of Britain as an ’empire’ on the way down with the currency trending down accordingly. When I was a kid, GBP was about 1 GBP to 1 SGD and it has been going steadily down ever since. Long term national strategic economic policies and measures determine long term currency trends. US is doing very little long term measures and its institutions don’t seem capable of them. My feel is that US will go the way of Britain as an ‘empire’ on the way down with the currency trending down accordingly. When I was a kid, GBP was about 1 GBP to 7 SGD and it has been going steadily down ever since. A net of caution… As we allknow the sgd is a currency that targets a rate against a basket of currencies. There is a real risk therefore that some of this change is due to the basket being re-balanced and that whatever growth the us sees will be less reflected in sgd because the basket has moved on. That is before even looking at whether or not the us can sort themselves out and indeed whether they actually want a strong currency. The British government (or certainly the BoE) seems quite happy with it’s weak pound.